Get great Venice Information when you visit Venice Italy! Don’t want to be Surprised in Venice Italy? 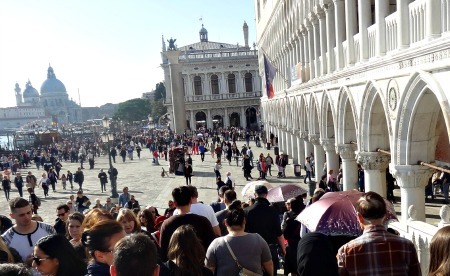 "Tips, Tricks & Tours - You Can Spend Extra Time with Your Family to Enjoy Venice!" Hello, this is Venice Information .com. I'm Rudmer, and I make sure that you can enjoy yourself better and experience the city more cheaply. Yes, reading my information will save you money. I love Venice. You see I went many times to Venice. Some were romantic holidays, some were just for fun. Now I'm an expert. I tell my personal tips and Information. Learn from my experiences, learn from the do's and don’ts. All you need to know you can read it here on my Venice Information site! There is so much to discover when you go to Venice Italy. Will the city fulfill your expectations? Is Venice the same as on photos and in movies? What do you think? Why i'm asking? Because it's a fantastic city after your flight, the canals, the Venice Italy Hotels, and the Italian people. The Venice Italy Attractions and sights and the fun after a gondola ride in Venice. And you? Are you ready for a Holiday Vacation in Venice and a City trip to this beautiful city? You don't need any knowledge of Venice. I will explain you all the Venice Information I have in a fun way what to do! "Read my quality Venice information and love the city..."
When I went to Venice for the first time, I stayed a week in this city! I was just married. I bought tickets for a flight to Venice Italy. Did you realize there are two Venice Airports? Which airport is yours? Well, I was suprized when discovered it had two airports. Read about in my explanation and own experiences. But know, finding a Cheap Venice Hotel requires preparation! 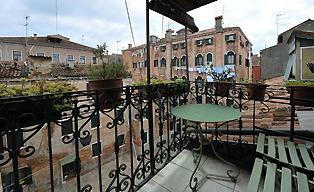 There are beautiful Apartments in Venice for Rent, B & B, and what about hostels? I can help you! Did you know there are significant Budget Accommodations and Campsites outside Venice? And how do you get from Venice airport to the historic center? And in which is the best period to visit Venice Italy? All I 'll explain! Read my Venice tips and the weather in Venice. I also have suggestions on Venice Carnival. And not to forget; see the Rialto Bridge and the Doge's Palace. Oh, yeah, and Venetian glass! On the island of Murano, you can see how they are making the glass traditionally way. See the Facts About Venice to brush up your knowledge of this city in a nutshell. Another great subject on my site is the fun of the city trip. A short holiday you make to go shopping and learn about the culture. I have discovered the secret Venice Shopping spots. Read all about it! It is for me fun also to tell you a little bit about the history of Venice Italy. The first settlers were farmers and fishermen from around the Veneto area. They discovered some islands just above the water-line. These islands were made out of tree trunks gathered from the nearby mainland, fasted down into the silt. Nice to know before you go to Venice right? There is so much to tell about Venice. A city that you must visit and which is more than the opinion of a day tourist!!! The day tourist is somebody who will visit Venice on a hot summer day from their campsite or cruise ship. Sign up now, and your subscription will start with the next issue. Enter your address, and I will add you to my newsletter list. First tip! Don’t stay around too long around Piazza San Marco! Explore Venice! Hide in the narrow alleys and walk over its hundreds of bridges. Or even go to the less touristy islands, like Torcello, Burano or Murano! OK, are you ready to explore more about your Venice holiday?